PBB, Inc. is a World Class architectural hinge manufacturer that takes pride in providing and maintaining high quality products that meet or exceed any standards in the field. PBB, Inc. template hinges are manufactured to close tolerances and meet all specifications and requirements set by the American National Standards Institute (ANSI). Additional Option: Non-Removable Pin (NRP) feature is used in applications where you have an out swinging door where the hinge is exposed and you want to protect against unwanted entry. 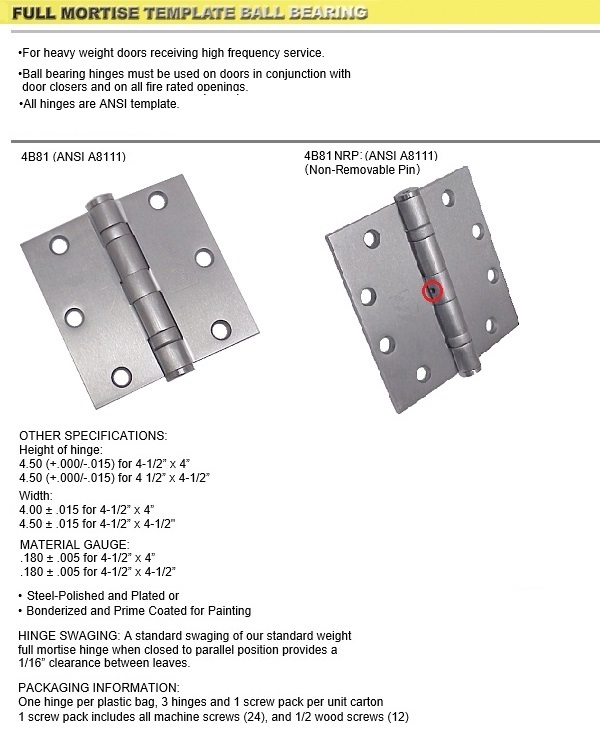 PBB 4B81 Ball Bearing type hinges mused be used in conjuction with Door Closers and all Fire Rated openings.